What’s not to love about skirt steak? It’s a great cut for grilling — whether indoors on a grill pan or outdoors on a grill. Plus, skirt steak is an affordable option for juicy, flavorful steak that cooks in just minutes. 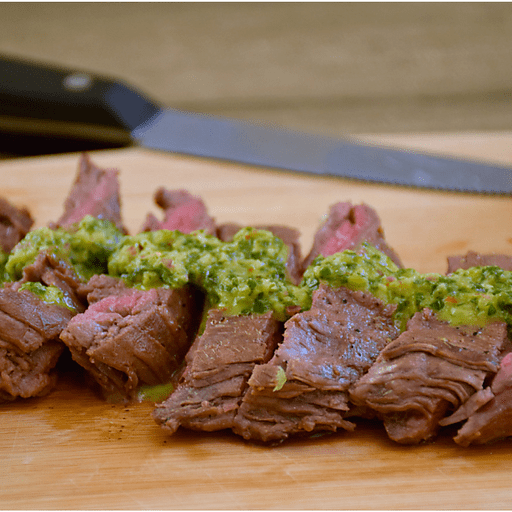 This recipe features a quick and zesty marinade for the steak and a traditional Chimichurri Verde sauce that will send your taste buds on a south-of-the-border adventure! 1. Whisk first 7 ingredients together and place into a large zip lock bag. Add skirt steak to bag and allow to marinate overnight. 1. When ready to grill, season steak liberally with salt and pepper. Grill 3–4 minutes per side to achieve medium-rare doneness. Let steak rest on cutting board for 10 minutes before slicing. 1. Meanwhile, add remaining ingredients to a food processor. Blend until a smooth sauce is formed. Spoon chimichurri sauce over sliced skirt steak and enjoy. Ask our meat associates for assistance with trimming the skirt steak before you purchase. For gluten free: Use tamari in place of soy sauce. Per Serving: Calories 290, Total Fat 27g (Saturated 5g, Trans 0g), Cholesterol 25mg, Sodium 360mg, Total Carbohydrate 4g (Dietary Fiber 0g, Sugars 1g), Protein 8g, Vitamin A 10%, Vitamin C 30%, Calcium 2%, Iron 6% *Nutritional values are an approximation. Actual nutritional values may vary due to preparation techniques, variations related to suppliers, regional and seasonal differences, or rounding.